Hack A Day’s own [Jack Buffington] finally finished the solar clock he built for the buildlounge.com laser cutter giveaway. [Jack] has been putting up the build log on his blog, and now the project is finally complete. The clock operates entirely on solar power. Instead of fancy-smanchy electronics, this clock puts a new spin on the very old school sundial. A box outside [Jack]’s house captures sunlight and focuses it onto an array of optical fibers. These fibers transmit the sunlight though the wall and to the face of the clock. 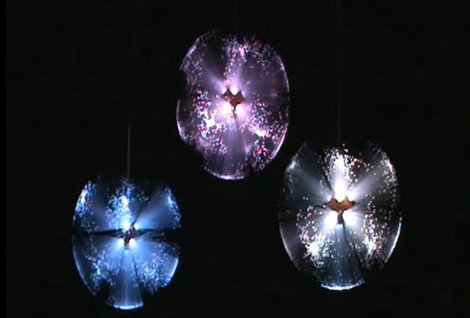 Only a portion of the fibers are lit at any one time, and these correspond to the time of day. With a lot of confusing fiber routing, the clock can indicate the time of day by lighting up the clock face. We covered the nascent beginnings of this project when it was still a glimmer in [Jack]’s eye, and we’ve got to hand it to him. This is a really creative project, and the addition of the ‘daylight savings time lever’ is the icing on the cake. Check out the video after the break for a great explanation of how the clock actually works, and be sure to check out the project on BuildLounge. Hack a Day’s very own [Jack Buffington] is throwing his hat into the ring for the Buildlounge laser cutter giveaway with his solar clock that isn’t a sundial. The theory behind [Jack]’s clock is pretty simple. The light from the sun will be captured by a camera obscura/pinhole camera. The sun’s rays shine on dozens of optical fibers that lead indoors and up to the clock. These glass fibers go to pinholes in the face of the clock which light up, showing the time. [Jack] already cut out the face of the clock on his (awesome) home-made CNC router. He hasn’t gotten around to cutting out the mechanics of the clock face so the clock can be adjusted throughout the year. We’re okay with that, because we’re really not ready to see [Jack] fiddle with his gnomon. At least before [Jack] gets his hand on the Buildlounge laser. The next major hurdle of the build is the solar collector that collects light into different optical fibers. That’s going to involve a lot of math using the equatorial coordinate system. Help is available, though. Check out [Jack] cutting the clock face on his router after the break. [Bill the “Engineer Guy” Hammack] is back with another lesson in the science behind the technology we know and love, but might not fully understand. This time around he discusses fiber optic cabling and how it is used to relay data across distances both small and large. He starts off by showing how laser light can be easily transmitted from one end of an audio-grade fiber optic cable to the other. 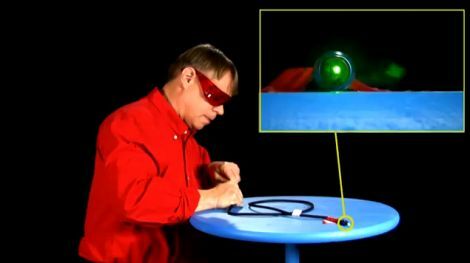 To show us how this is accomplished, he sets up a simple table top demonstration involving a bucket, some propylene glycol, and a green laser pointer. The bucket has been modified to include a clear window at one side and a spout at the other. The laser is carefully lined up, and when the spout is unplugged, a steady stream of propylene glycol is released into a second bucket. As [Bill] explains, the laser stays within the stream of fluid due to total internal reflection, and can be seen shining in the second bucket. [Bill] also discusses how fiber optics were employed in the first transatlantic telecommunications cable, as well as how pulse code modulation was used to send analog voice data over the undersea digital link. As always, [Bill’s] video is as entertaining as it is enlightening, so be sure to check it out below. [Dino Segovis] wrote in to share yet another installment of his Hack a Week series, though this one is quite timely. It was 131 years ago today that [Alexander Graham Bell] unveiled the Photophone to the world. A precursor to fiber optic technology, [Bell’s] incredibly important invention can be easily replicated in your garage, as [Dino] shows us. The original Photophone was constructed using a megaphone and crystalline selenium cells at the focal point of the receiver, however this version can be made with easy to obtain parts. 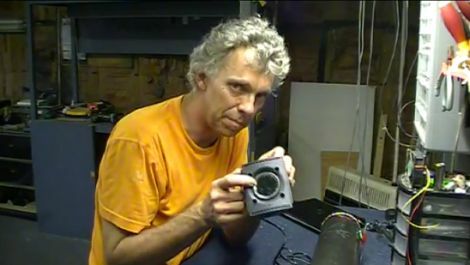 [Dino] rigged his laptop up to a speaker on which he mounted a mirror, before setting it out in the sun. The vibrations of the mirror modulate the sunlight, reflecting it onto a solar cell positioned at the end of a long, black PVC tube. The solar cell’s leads are fed into an amplifier followed by a speaker, which broadcasts the audio. The demonstration goes off without a hitch, and while some might be underwhelmed by the technolgy, imagine how incredible it would have looked 131 years ago!